Resulted from a cross between M.16 and M.9 in 1929, at the East Malling Research Station, Maidstone, Kent, England. 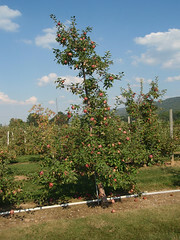 Traditionally considered a dwarf rootstock, but is one of the more vigorous dwarfing rootstocks. 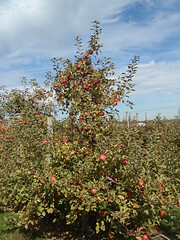 M.26 is grown widely throughout the world and is included as a “standard” in many rootstock trials. M.26 is precocious and very productive, produces many burrknots, and is susceptible to crown rot and fire blight. In a joint effort to produce virus free rootstocks, the East Malling and Long Ashton Stations in England used heat treatments to eliminate known viruses and released M.26 EMLA. A similar virus indexing program in the Netherlands released M.26 NAKB. In general, virus-free rootstocks are slightly more vigorous than the original that contains viruses. Two strains of M.26 were compared in the 2002 NC-140 trial at nine locations with the scion ‘Gala’. Trees on M.26 NAKB were slightly more vigorous than trees on M.26 EMLA at most locations and productivity was similar. 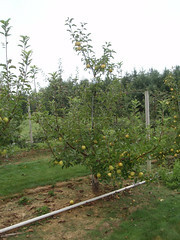 'Golden Delicious' on M.26 in 10th leaf. Photo by Robert Crassweller, Penn State. 'McIntosh' on M.26 in 10th leaf. Photo by Robert Crassweller, Penn State. 'Fuji' on M.26 in 10th leaf. Photo by Robert Crassweller, Penn State.